Alright. Let's talk about my kitchen. Like I mentioned a few days ago, my kitchen is finally finally done! And it only took a year and a half. But the end result is totally worth it, right?? Fast forward 4 years, and here's what it looks like today. When I walk into my kitchen I can hardly believe it's the same room. Here's what it looks like now (when it's clean). Now let's get into some of the details. did ALL the work ourselves. ALL. Okay. So that was the summary. Here are the details. To save money, we didn't remove the wall that separates the kitchen from the living room. People renovating with a similar floor plan typically do this, but it would have required considerably more time and cash-- two things we sure don't have a lot of these days!! I still wanted that space to feel unique, so we added some open shelves between the upper cabinets to display some pretty stuff and tiled all the way up to the ceiling. 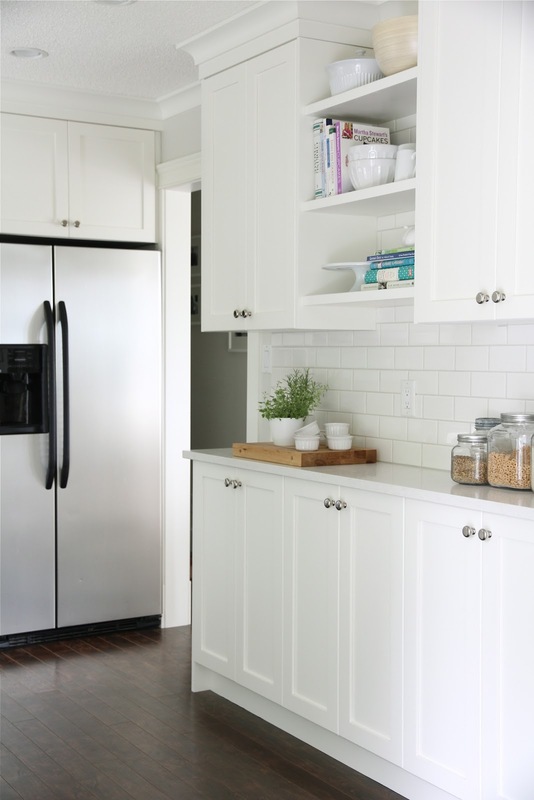 The lower cabinets are the same depth as the upper cabinets which keeps the room feeling spacious but still gives us added storage and counter space. This next area of the kitchen required the most amount of work. When we moved in there used to be a floor to ceiling window right where those open shelves are located. 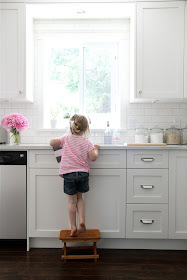 While I loved all the natural light the window gave, the kitchen really really needed more counter space and more room for drawers! Previously I had 3 really teeny tiny drawers-- now I have these 6 big ones plus three more on the other side of the sink. And I can't tell you how much of a difference the extra three feet of counter space makes when I'm working in the kitchen with all my little "helpers". It really makes this room so much more functional. 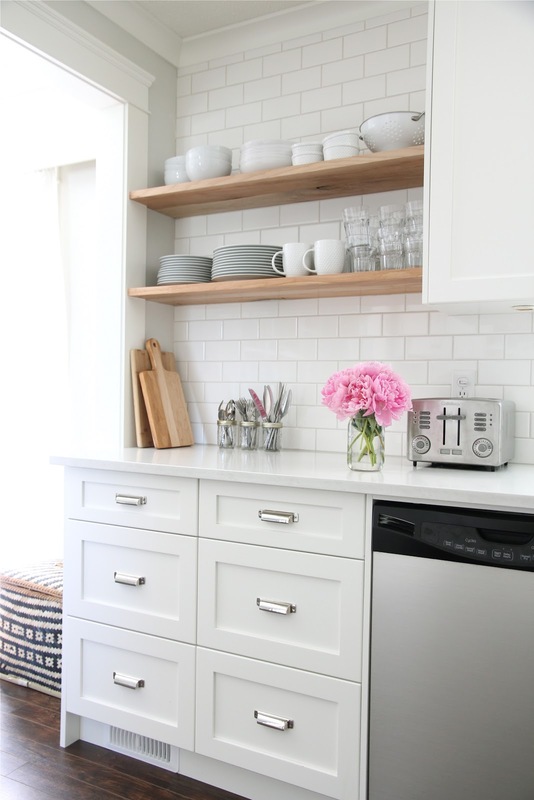 While this spot of the kitchen is definitely more functional, I also wanted it to be pretty. Isn't that what we all want? A kitchen that's both functional and pretty?? So... bring on more open shelves! 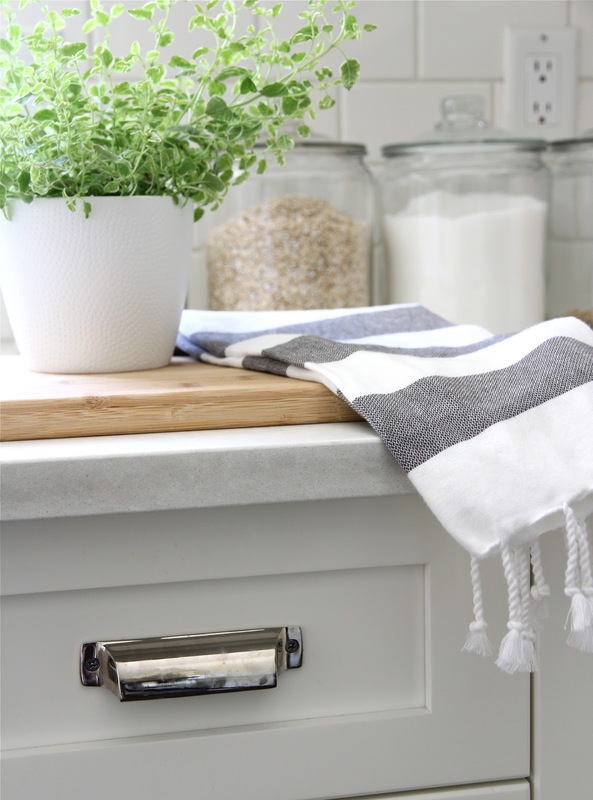 My kitchen is a very white-- and I love it-- but to keep it from feeling too cold and clinical I added some natural wood. These natural wood shelves turned out to be my absolute most favourite part of the kitchen. They turned out way better than I ever thought they would. They were also a money saving solution-- the wood was free as it was just sitting around the shop taking up space and we didn't have to pay to have them sprayed like other finished parts. These shelves hold all of my everyday dishes and glassware. 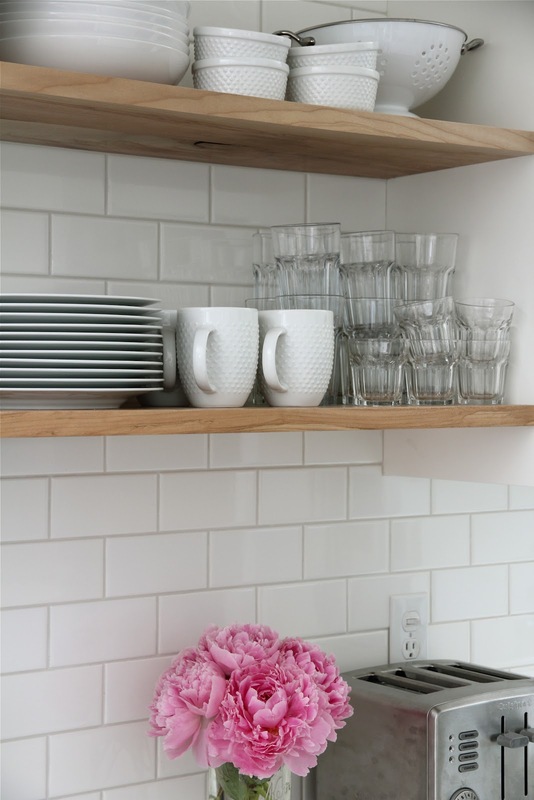 It's the perfect spot-- I unload my dishwasher right up onto those shelves-- no opening cabinet doors and moving things around-- everything gets stacked right up on these shelves and is used every, every day. I've had a lot of people email asking about our countertops. Even though I love marble, I knew that it could be a risky choice for my kitchen since we cook and live in this room all day long. So, I decided to go for quartz since it's a much more durable option. 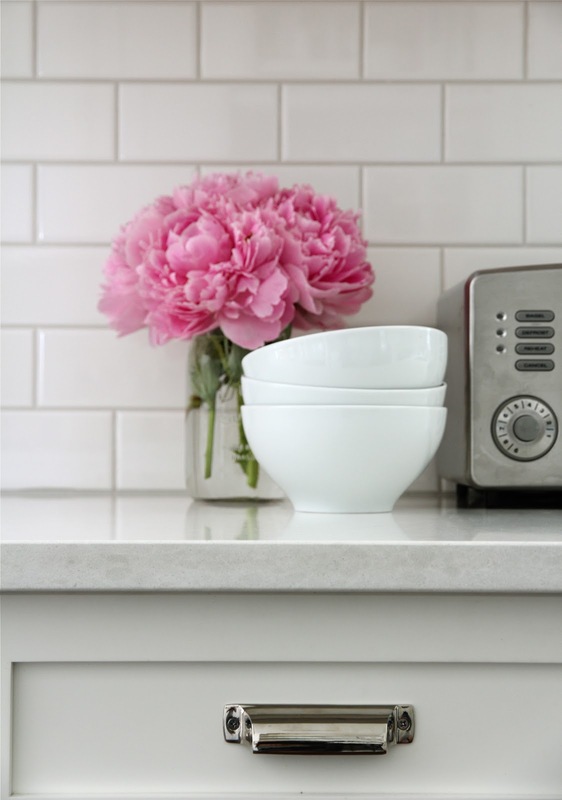 I was going to go with Misty Carrera by Caesarstone, but in the 11th hour I discovered that the countertop company we were going to work with sold a generic brand of quartz that had a colour that I liked even better than Caesarstone's Misty Carrera. The spots and colour variation is more subtle than the Misty Carrera and is a tad less "grey". And the best part was it was 40% cheaper than the Caesarstone option. Pretty much a no brainer if you as me! Others have asked about our cabinetry hardware. The bin pulls on all of the drawers are from Restoration Hardware and were a splurge. To save a bit of money I ordered knobs in the same finish (polished nickel) from an online supplier that were considerably cheaper than the matching ones from RH. And, I really really love them. Our faucet was a major save-- Ikea. $79. And I was like... WHAT!!? Seriously. It has the look I wanted and for $79?? Again, a total no brainer if you ask me! I love the handles-- they have a vintage vibe that I totally love. And the backsplash. 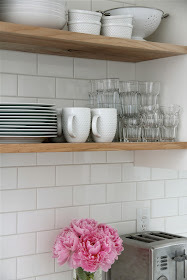 We saved money using a standard 3x6 white subway tile from Home Depot. Even though our backsplash tile choice was cheap, it's still a classic look and I really love the way it looks all the way up to to the ceiling behind the open shelves, and around the kitchen window. I also really love the light grey grout we selected. It is subtle, but really makes the tile a feature in the kitchen. Next week I'll do a special post listing the sources. I bet you can't wait!! If anyone has a specific question they want answered leave one in the comments or feel free to email me directly. To conclude, I'm just going to brag about my hubby for a minute. Doug designed/built/installed this kitchen with his own two hands. ALL OF IT. I knew he was good at what he does-- but even I was amazed at how GOOD he is at building kitchens... and how GOOD he is at all the little details that most people miss and don't notice. I could explain my vision to him knowing that he would and could create exactly what I dreamed up. Every little detail is perfect. Exceptional. Every day I walk into my kitchen and I can't believe Doug made it. What would I do without him!! So, if you live in the lower mainland and are looking for a cabinetry guy-- I know a really really good one!! Shoot me an email if you want some info. ps: sorry 'bout the amateur photos-- still learning! 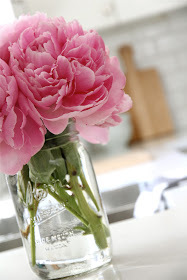 pps: don't you just love how those pink peonies made it into almost every shot?? ppps: pink peonies are my absolute favourite flower. And a bundle for $5? Score. pppps: wish I could have each and every one of you over for an awesome party so we could enjoy this kitchen for reals!! Oh my gosh. It is outstanding!! I love every bit of it. Beautiful. Absolutely beautiful! Next project my house? Its a disaster zone. I would (almost) get on a plane from Thailand to come party in that kitchen... for reals! ;) Its honestly stunning. Every single detail of it. 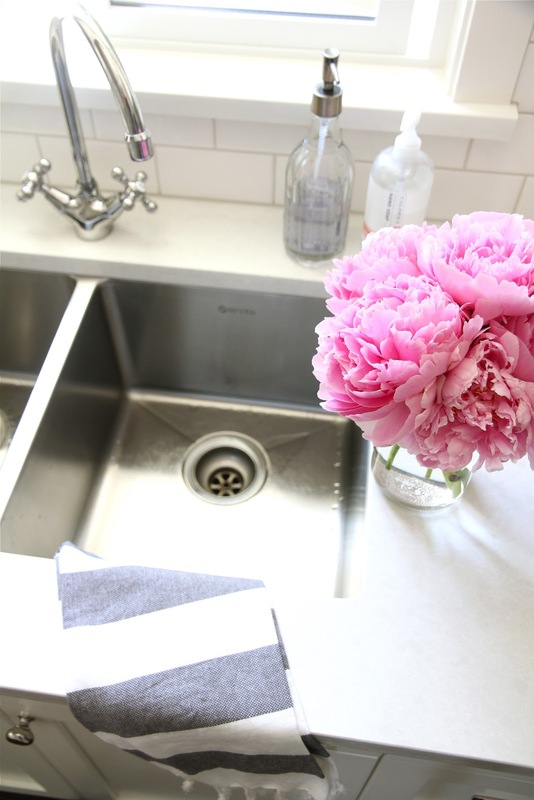 And I have to say, the pop of pink peonies really do take your pictures from "amateur" (as you said... and I don't agree with), to "style @ home-esque." Lovely, lovely, lovely. Gorgeous. We're redoing our kitchen now and I was lusting after those pulls. Too bad I don't have a Doug, we had to go with Ikea cabinets. 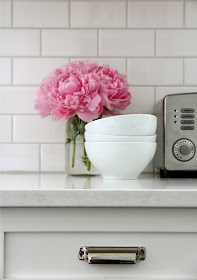 Very random question after such beautiful kitchen revel but where is your white utensil crock from? Everything about this kitchen is amazing! I have to ask where your hand towels are from! So beautiful and fresh! Love the countertop. Great choice!! Looks Stunning & great photos! I think the best part of your kitchen is that you shared the design work with your husband - those are the best projects to work on ever!! So beautiful!! Light, bright and amazing!! I'm moving in. I'm saving this away for my future white, bright one day kitchen! Dreamy! I'm going nuts over this kitchen! Gah, it's so gorgeous!!! And how incredible that your husband BUILT it! Stunning. Your kitchen looks great and must feel even greater to have it finished! Just wondering where the white mugs with the bumpy outside are from? I love it! I love it! I love it!! So fresh and pretty, relaxed and perfect! And how cool to live and work in a kitchen built by Doug! Well done. Enjoy!! Those pics don't look amateur to me. LOOKS SO GOOD! Way to go Doug! Wow your kitchen is absolutely gorgeous! I'm about to start studying interior design, and your kitchen is like my ultimate inspiration! Props to you and your hubby, it's gorgeous! Gorgeous! Now I know who to contact if and when we buy a house and if and when I renovate a kitchen! I love your kitchen, it would be exactly what I would want! As for the photos, they look amazing! Straight out of a magazine! Your photos are great-they don't look amateur at all! But I bet the kitchen is even more amazing in real life! it is absolutely gorgeous! I'm so glad that Christine (from Just Bella) told me the source of the photo I pinned! I'm going to be showing our tiler the photo of your backsplash, the grout colour is exactly what I'm wanting for ours. Thank you! Aaaah, this looks so beautiful! You`ve done a real great job on this room! Your kitchen is a DREAM! Love it!! Gorgeous! So crisp and clean with the white. Love the open shelves. Bet you're going to love cooking in there! We JUST bought our first house yesterday and the kitchen needs a makeover. 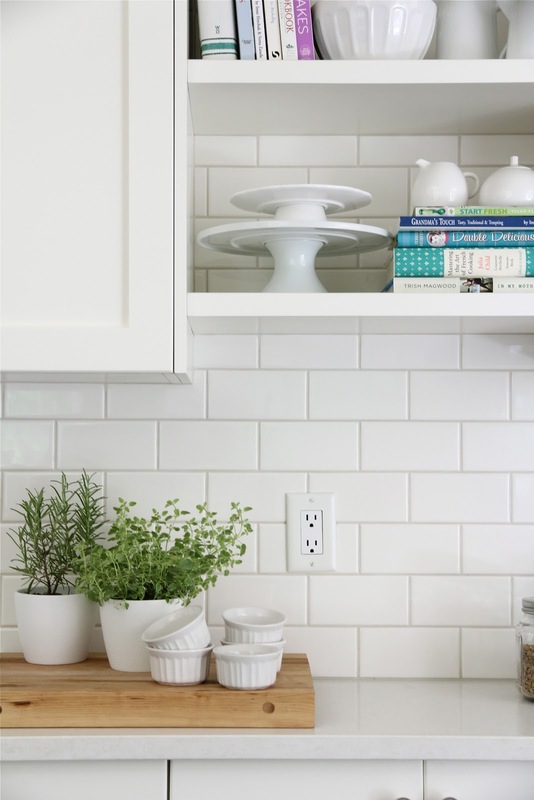 I was wondering if Cloud White and white white subway tiles would look good beside each other....so naturally, I googled it. Came across your blog and WOW! Do they ever look good together! Your kitchen is exactly what I'm going for - butcher block tops for us though. Thank you for sharing! Now if you'll excuse me, I'll be spending the next 2 hours going through your archives. 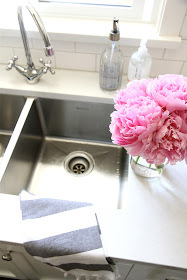 my husband and i are about to redo our kitchen right now and i searched kitchen on pinterst and saw yours! it's so wonderful. i've been wanting to do reclaimed wood for open shelving. how did you hang yours is my question?? any tips!? thanks so much. and enjoy that kitchen! I love the way your kitchen turned out! So crisp and happy. I'd love to pin this to the Home Depot Kitchen Pinterest board if you don't mind. Thanks Caroline! Go ahead and pin away!! dying. i adore this kitchen and saw something similar in a magazine once. i loved your details and am so happy you shared your choices with us. way to rock the DIY homedecor and renovations!! What are you talking about with your photos!? These look straight out of a magazine! 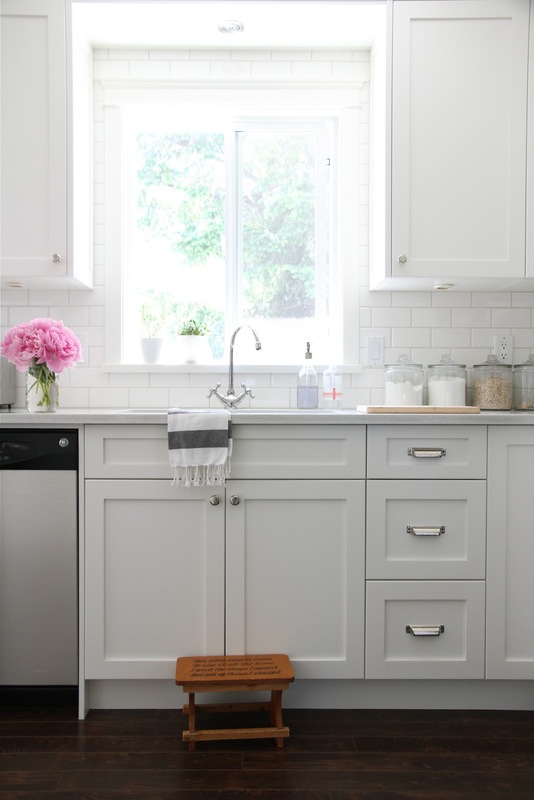 Such a gorgeous kitchen...love the subway tiles with the light gray grout and the quartz counters, Aso love the open shelving in the natural wood...definitely warms up the space. Amazing job!! Hi there, I just discovered your blog via Cottage and Vine. Your kitchen is amazing, and just what I'd like to have one day. I love all the details you chose, especially the open shelves! Your husband does fantastic work. You are very lucky to have him! I look forward to browsing the rest of your blog. Meanwhile, I'll be pinning photos of your kitchen for future reference. Claudia-- it's a Cuisinart and I got it from Costco! We live in the lower mainland, and I love your kitchen. Would love to know the source for your fabulous countertops! New follower here. Love, love, love the way the kitchen turned out! Will definitely use this as inspiration when we can finally tackle our kitchen. So happy for you! I love the gray color on the walls. What color is that?! Thanks. Beautiful! All of it; just beautiful!!! I absolutely LOVE what you did with your kitchen!!! I'd like to know more specifics about the countertops. What is the generic brand? Are you able to give an apx amount spent on the total renno? We are looking to redo our, but a little afraid of what the total cost will be. Your kitchen turned out amazing! Cheers to having handy husbands who can build amazing cabinetry. We're in the midst of a kitchen remodel ourselves, I'm blogging all about it here. We'll be building some inset doors and getting quartz countertops installed soon hopefully! I absolutely love this kitchen. I love the white with the pops of natural. Popping over from Cozy Cottage Cute and now following. 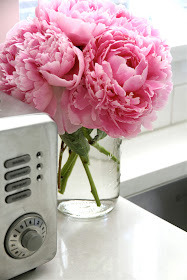 Peonies are my favorite flower as well! Beautiful! Could you provide more info about your generic quartz? Thanks! 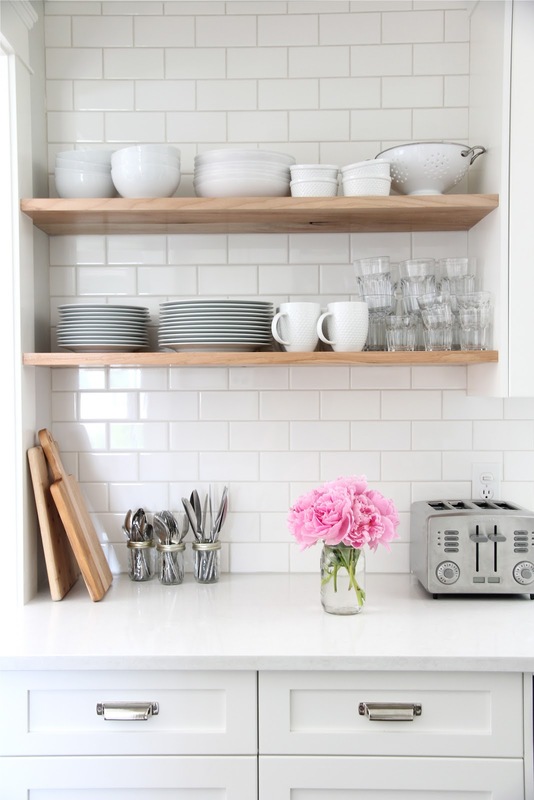 saw this on pinterest today.... the all-white, the subway tile, the open wooden shelving!! swoon. Love the look of your kitchen! I am wanting that exact color grout for our backsplash. Do you know the color's name and brand? Thanks! I'm in love with your kitchen. 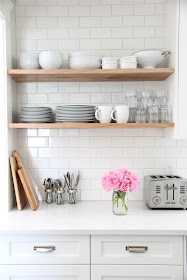 This may be a question for your husband... how are the floating shelves installed? I don't see any brackets and yet the plates must be heavy. Thanks! Your counters are amazing...off to check out your sources for the brand! I absolutely love this! I'm pinning for my next home. Well done! Can I ask what color you painted your cabinets? They look gorgeous. Its really outstanding and looking elegant. I like your kitchen very much. Thank you so much for sharing. Granite Countertops. I am replicating your kitchen at my house!! Where are those beautiful handle pulls from? Did your hubby build the cabinets himself or did you order them? I love the style. I was wondering what size RH pull you got. Are they the 3" or 4"? Also, where did you order your knobs from? Thanks! AMAZING AND VERY INSPIRATIONAL. I have pinned about half your picture for future reference for wortop, tap and tiles lay outs. Your kitchen remodel turned out AMAZING!!! WOW!! I love. And the shape is so much like ours... so it's great inspiration. 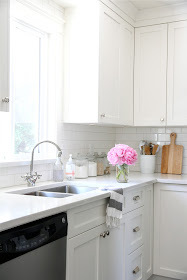 I am going to be tile-ing my kitchen, and building a surround around the refrigerator... and I'd really LOVE to see how your kitchen looks from this angle: http://3.bp.blogspot.com/_bVnkA0WASJo/TO2NNUD4_TI/AAAAAAAABa0/gfqC9AL5nO4/s640/IMG_5629.JPG Do you have a finished photo of this angle? :) Pretty please?? Your kitchen is so pretty! Beautiful kitchen! Can you please tell me what color of grout you have used on your white subway backsplash? Also, is it 1/8" grout between tiles? 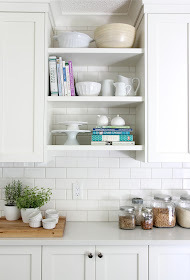 Love the subway tiles with the light grey grout:) Question: Did you put spacers or no spacers between each tile? 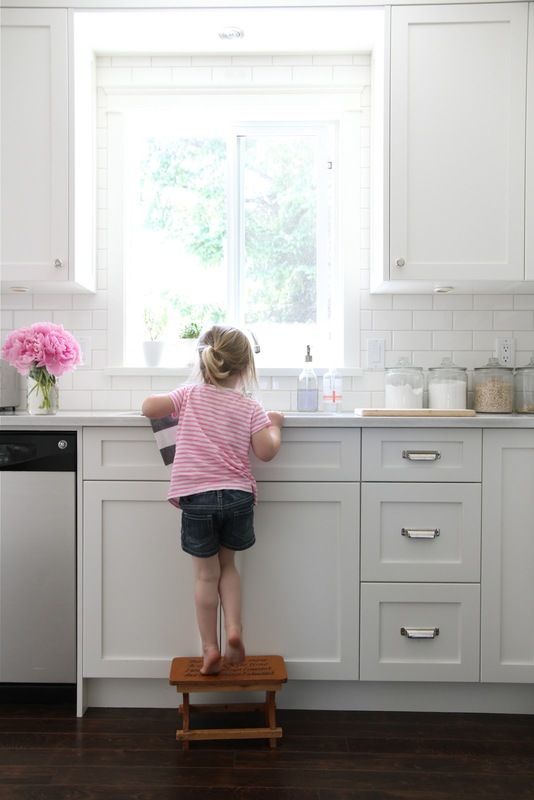 Wonderful tips for re-doing a Kitchen.Whenever you are going to have the home remodeling , one thing must keep in mind that the budget. First know whether the things are in your budget or not because the remodeling seems to be very costly.Also, when i had the home remodeling , i only prefer things that i had in my budget. SO budget is the main concern when doing remodeling. Wow, what a huge kitchen! 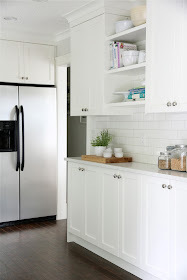 I like white color kitchen cabinets. White color gives fresh. I really like pink color flowers to decorate kitchen which looks very pretty. I must save this blog link for upcoming updates. Thanks for sharing this blog. What is the name of your grout color please? Absolutely beautiful kitchen! Not sure if you responded to the previous inquiries regarding the quartz countertop brand and color. I am interested in the one you used. Also, what color grout did you use and where did you purchase it from? there are so many gray color grouts out there but I love the one you chose. Thanks! I love your kitchen shelf, it's really creative, and the white color gives an elegant and luxurious side to the kitchen. 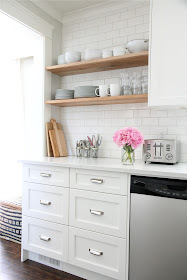 my husband and I would like to install white shelves on the wall our kitchen, this is a moment that is also looking for shelf models and really like your style but my husband cracked on this little kitchen that we saw on http://www.archiexpo.com/architecture-design-manufacturer/kitchen-shelf-75.html. Otherwise, this site offers a lot of choice of beautiful kitchen shelves, very practical, design, and strong. Go take a quick look. Do you by chance recall the color of the grout from home depot? We have the same tile going in with white Corian countertops and the gray grouts at Home Depot look so dark. I want mine to look like yours. Thank you! I found a picture of your kitchen on Pinterest and fell in love immediately! We are finalizing plans for our kitchen reno and you pretty much nailed every detail. LOVE. And my little heart fluttered every time I saw the pink peonies!! They are my fav flower ever. You've got some great taste, girly. Could you tell me the brand and name of your quartz? Could you tell me the color of the grout you used for your backsplash? thanks!! looks amazing. on the backsplash with subway tile? what color grout did you use in the subway tiled backsplash? Hi there! I love your kitchen. Can you tell me what spacing you used on the subway tile? Love everything about this! I am also wondering about the colour of the grout. Did it also come from Home Depot and do you by chance know the name (was it just called light grey)? Beautiful kitchen! What color grout did you use? what an absolutely gorgeous, beautiful kitchen!!! we are currently needing to remodel ours too and yours is definitely an inspiration. i wanted white and clean and minimal but warm. you nailed it! and how lucky are you that your hubby made this?! i wish you guys were in my area! I'm in love with this kitchen. Its bright, open, elegant, and absolutely gorgeous! Will definitely be using this as an inspiration for my kitchen. Your kitchen is just beautiful, and very close to the way I want mine to look! We are just now getting estimates for our minor kitchen remodel, in preparation of putting our house up for sale within a year. Since our cabinets and island are in good condition, we will just be refacing them. I have chosen to go with white for the cabinets, and the same type of countertops as you chose. That way, our black and stainless double ovens will not be so out of place since the gray in the countertops will balance them. Obviously, I will be trying to keeps costs down, so I read you description of the material with interest. Can you please give me an idea of cost /sq. ft. and what I should look for? Love the grout color. I see many people asked what color/brand you used--can you please share? There are many "light gray" grouts out there. Thank you! What online supplier did you use for your knobs. I am assuming the restoration hardward ones are the 3" Deluth? I want my kitchen to be clean and neat and I need it to be remodeled. You have a beautiful and neat kitchen. I can say that one and a half year was totally worth it. The quartz looks like it might be Carrera by PentalQuartz - we compared the two and it fits the description here. Very nice. 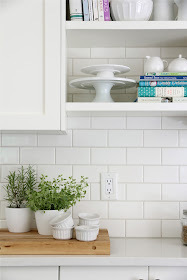 Did you use spacers for the backsplash tile? I purchased them from home depot as well and have been searching for tips. What a beautiful kitchen. So organized and neat. Love the color. What a fantastic, minimal yet homely space you have created! You must be so relieved after all that hard work! Really nice blog! Thanks for sharing.. This is a dream kitchen. My wife loves the all-white-everything style and I bet she would love this one. Let's see if the redesign of our kitchen can go a different route. Amazing pictures:) Renovating a kitchen from scratch is quite a difficult job. According to my opinion it can't be possible without professional assistance. Hiring a professional remodeling contractor is the best decision to avoid problems. What an amazing journey! The pictures tell it. I would love to know the color of grout you used in your beautiful kitchen? Not sure if you check this blog anymore, but I would love to know the specific quartz brand and color that you selected. I am driving myself crazy trying to decide between all of the great white options. Appreciate it! I LOVE your kitchen. We are updating our kitchen and want to do the backsplash just like you did. Can you tell me the exact brand and color grout that you used? We want to get use that color but can't seem to find one that is similar. Your kitchen looks amazing!! Do you mind if I ask, did you put any sort of finish/sealant on the wood floating shelves? Also, what type of wood is it? Love the kitchen! I am looking for wood like you used for my countertop and shelves. Do you know what Type of wood it is? Thanks! Hi! I love the kitchen! We're getting ready to use the white subeay as well. Is the grout the oyster gray from home depot? Thanks so much! Hi! Beautiful kitchen!!! Can you tell me the specific tile you purchased from HD? Also... what is the grout you used? Thanks!!! I'd love to know the name of th grout you used. I spent a long time scrolling through your comments trying to see if you ever answered everyone's questions about the specific grout color and place you bought it. Would you mind taking a minute to share that with everyone. Also, I have the same question as everyone else about the spacers that you used. It's frustrating to have you share so many details but leave these particular details out and not respond to so many inquiries. Not trying to be rude...just really like to know the answers to these two questions. Thanks! I LOVE your kitchen, it's beautiful. What a fantastic makeover. Really awesome! Thank you so much for sharing your renovation of your kitchen. you are amazing. your kitchens are awesome. Good choice to choose kitchen extensions. Beautiful and amazing pictures of kitchen. I liked your Backsplash Tile For Kitchen, you used it very well. Thanks for sharing this with us, I really enjoyed to read your blog. Interesting blog and I really like your work and must appreciate you work for the kitchen remodel nice work. GROUT NAME AND SPACE SIZE PLEASE!!!!! Nice thanks for sharing the informative content. Very nice blog post. The kitchen is looking so beautiful. Thanks for sharing this post with us. Beautiful kitchen! thanks for posting. Nicely displayed information in this posting. I truly would rather examine this California king involving things. The caliber of written content is fine along with the realization is great. Thanks for your article. Continue inside foreseeable future. This is awesome! I've been trying to do some Kitchen renovations Austin, and this gave me some great insight for things to try. Thanks for sharing! Interesting blog and I really like your work and must appreciate you work for the remodeling kitchens well done. I found this is an informative and interesting post so i think so it is very useful for me decorate my kitchen in a good way! Great blog! thanks for posting. choosing the best style which would fit you is absolutely important Another thing is It might be time-consuming, but it’s pretty much worth the trouble. 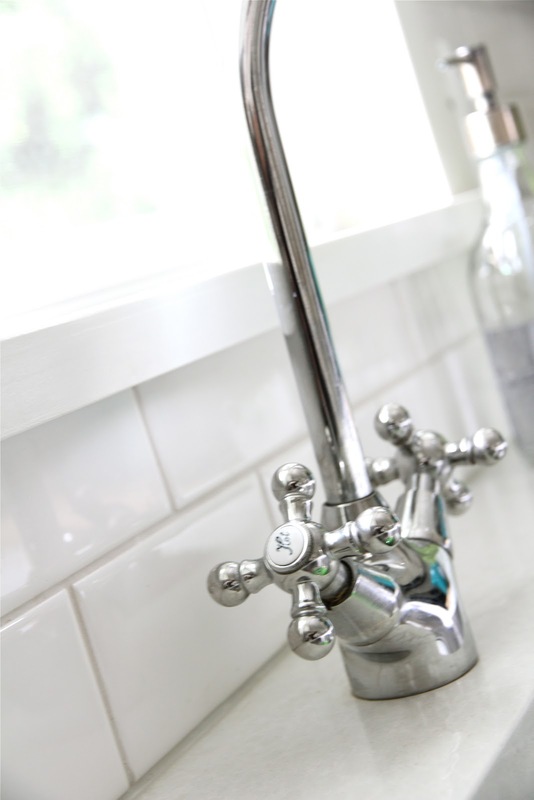 You can even check out the kitchen faucet reviews on the website to help you out. Trust me, it’s way faster! When looking for the perfect 18/10 Stainless steel cutlery importer, we are Imported Cutlery/ Cutlery Importer and Importer of Crockery in India. We provide Cutlery Glassware. I think we need to decorate our kitchen and bathroom beautifully. So I am providing the kitchen and bathroom remodeling services in Chicago. If you need contact me https://goo.gl/maps/Y58FjgCzREw . This is a really nice post. I just liked it. Thanks for sharing the post. Thanks for writing this great post. We are the leading commercial general contractor Georgetown. We provide General Contracting and commercial general contractors austin tx, Round Rock, Dallas, San Antonio, Houston, and surrounding communities.